Photo and Fiction © Steve Lakey 2014. ‘Dig-Day’ was fast approaching. The Scarsbury v Coningshall Annual Vegetable Garden Competition was coming around again. Village rivalry was beginning to rear its ugly head. Having the competition on adjoining plots either side of the village boundary was supposed to have levelled the playing field. And made the competition one of pure gardening ability. Over the last ten years, Scarsbury had always taken the honours – some say not entirely fairly. Rumours of dirty tricks being played on the Coningshall allotments were now treated as fact in the village. There was the mysterious plague of locusts, followed by an isolated flooding during an otherwise long, hot summer. Then the Great Garden Robbery. What next? A pesticide attack? The answer was a huge surprise – a fence, twenty feet high, surrounding Scarsbury’s plot. They had no intention of letting Coningshall look over at their garden. What were they planning? A couple of days before the competition, Brian broke his silence. Although he still hadn’t reappeared, a note appeared on his allotment shed door. Nearby was a bucket full of bulbs. PLEASE PLANT THESE THREE FEET AWAY FROM THEIR FENCE LINE, AND FOUR FEET DEEP. IT MAY GIVE US THE EDGE. George wasn’t convinced that this could work. “Unless they’re magic beans, they aren’t going to grow in time!” But he pulled on his wellies with the other gardeners, and got digging. Brian knew his stuff. So, the great day had arrived. Still no sign, of Brian – apart from another note on the shed door. BY ALL OF YOU MARCHING AROUND TOGETHER, ON TOP. The Coningshall gardeners marched up and down the fence line in unison, and then broke into a spontaneous conga line, which in village legend later became known as the “Greenfields’ Stamp”. A few Scarsbury allotment holders came to have a look at the commotion. Their roars of laughter rang through the cool morning air. But the laughter quickly subsided, as a rumble could be felt running along the ground. The conga line broke and ran for cover. Slowly but surely, like a row of dominoes, one giant fence panel after another tumbled back onto the Scarsbury allotments. Each one pulled the next down and crushed all that lay in its path. Fortunately, the only thing hurt was Scarsbury pride. The judges arrived, and made their decision in record time. They awarded the Annual Cup, £25 Garden Centre voucher, and most important of all, village bragging rights to… Coningshall’s Brian Greenfields! Where had he appeared from? Using the fence collapse as cover, Brian had slipped out of the concealed tunnel that was hidden underneath his shed heater. 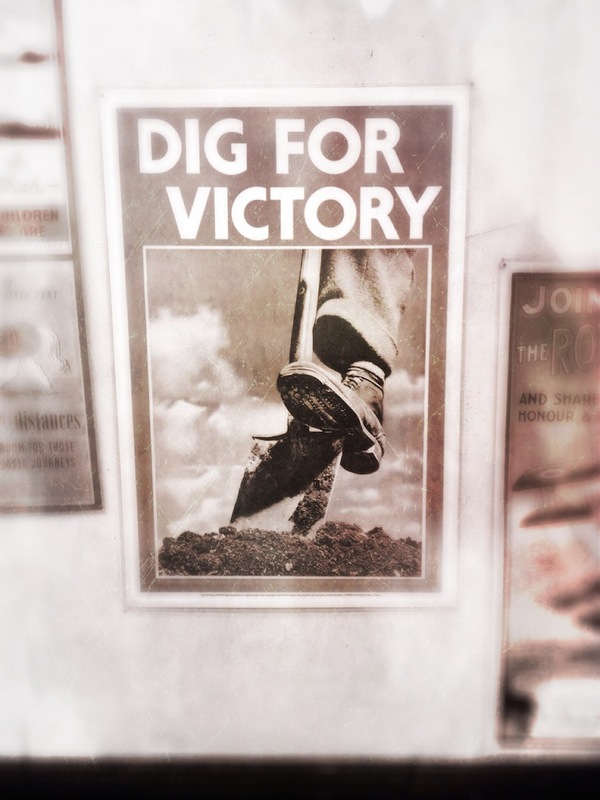 He’d quickly disposed of his miner’s helmet and lamp in a nearby compost heap. Dusting himself down, his brisk walk was timed perfectly to meet the judges as soon as they appeared. The Mayor of Scarsbury took great offence and permanently pulled his village out of the competition. This has left Coningshall as the Indefinite holders of the trophy, further undermining Scarsbury prestige. The Vegetable Cup now has pride of place in Coningshall’s Red Lion Pub – next to Brian’s bucket and spade. This photo and story were prompted by Pixel Prose Challenge, September 5th 2014, hosted by Amanda Lakey at UniqueArtChic.com.